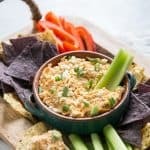 This buffalo chicken dip is going to be a huge hit at your next gathering. Lightened up with Greek yogurt but still packed with flavor. Gluten-free and keto-friendly. Place the cream cheese in the bottom of the slow cooker, top with shredded chicken, ranch seasoning, blue cheese and mozzarella, then add Greek yogurt, buffalo sauce. Spread the yogurt and sauce together over the chicken and cook on low for 2 hours. Stir the mixture together at the 1 hour mark and continue cooking on low for another hour or so. Serve warm with chips and veggies. Preheat oven to 350ºF and grease 8×8 baking dish. In large bowl mix together cream cheese, Greek yogurt, ranch seasoning and blue cheese plus mozzarella (if using) with sturdy spatula or electric mixer. Stir in buffalo sauce and shredded chicken until combined. Transfer to greased baking dish and bake for about 25 minutes. Option to top with more mozzarella cheese with the last 5 minutes of baking time. Serve warm with chips and veggies. See how to prepare shredded chicken in post. *Feel free to omit blue cheese if it’s not your thing. You can also omit the mozzarella if you prefer. Total cook time for the making this buffalo chicken dip will depend on method used. Slow cooker will take about 3 hours. Oven method total time will take about 40 minutes. Nutrition info approximate based on ingredients listed; full fat cream cheese and 2% Greek yogurt.